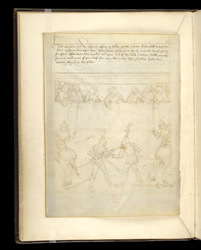 The pictures in the manuscript emphasise Richard's chivalric deeds over his military victories but always exploit any chance for grandeur and excitement. Here he engages in a foot-combat with Sir Pandolf Malateste, in the court of an Italian duke, sometimes identified as the Duke of Verona. The Warwick emblem, still in use today, of the silver bear with ragged staff is prominent on his helmet to identify him.